Have you ever wanted a quality pet carrier that looks just like a regular bag? We take a close look at one you might like with our Sherpa Tote Around Town Pet Carrier review. On the surface, it seems the ideal transportation system for suburban dog lovers. Smaller dogs don’t generally like to be underfoot in crowded areas like towns and cities. If you’re out hunting for a bargain or need to get to the coffee shop or even work, you need something quick and easy for your pooch to jump in. There are many options available online, but none looks as stylish as a tote bag design. It can look great too with your dog’s head poking out the top. Key to choosing the right pet carrier is that it has to be both comfortable and safe. In our comprehensive review of the Sherpa Tote Pet Carrier, we find out what customers are saying about it and weigh the various pros and cons. 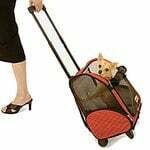 Undoubtedly, it’s the sort of dog carrier that fashion conscious people will gravitate to. Its simple design means this could be the perfect doggie bag for modern towns and cities. Let’s take a closer look. Pet carriers come in a variety of different styles. There’s the pooch pouch which acts like a baby carrier for dogs. There’s the traditional crate or kennel style carrier that can be a little bulky for some owners. And then there’s the handbag or tote carrier that looks chic and is becoming a favorite with young professionals in particular. For those living in towns and cities who don’t want to leave their dog at home, this is a clean, simple way to take them out with you. There is a range of tote bag style carriers to suit all tastes. The Sherpa product is one of the most gender-neutral which means it should appeal to both male and female owners. It looks more like a case you’d put a laptop in than a handbag than a dog carrier. What’s also useful is that the Sherpa Tote Pet Carrier has a large side zipper side pocket that is ideal for all sorts of extra storage. 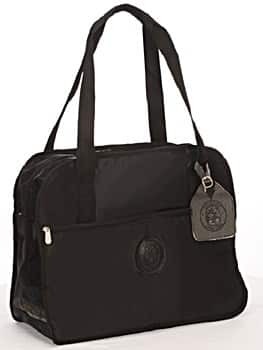 This is an excellent carrier for around town but not one for long distances. If you have to pop down to the local store with your dog, it’s ideal. Our review takes a closer look at what’s good and what’s not so good about this favorite Sherpa product. Sherpa is part of the Quaker Pet Group who have a good track record of developing great doggie products. Their range of pet carriers may be small, but they are well made and come at a reasonable price. If you’re looking for quality without all the fuss, they’re a pet brand worth taking a closer look at. The Sherpa Tote Carrier comes in just one size which can probably be considered medium. It measures 18” x 8” x 15” which makes it suitable for small breed dogs like the Maltese or chihuahua. It should be able to cope with any dog up to about 15lbs, according to the customer reviews. The bag comes in a limited number of colors: Black and tweed. Although not a discreet tote, another Sherpa carrier that you may like is the Sherpa Original Deluxe Pet Carrier. This carrier is recommended by the ASPCA, veterinarians, and other animal rights groups for the safety and comfort of your pet. Customers often choose this style of bag because they want to appear a little more inconspicuous. This is the sort of design which professionals tend to love because it blends in with their normal business persona. Dogs can either hunker down and rest inside or hold their head out through the opening. The interior of the tote carrier has a soft lining which can be removed and cleaned quite easily. If you need a ready to hand carrier for those quick trips out, it ticks a lot of the boxes, especially for those living in suburban areas. This is a flexible tote style dog carrier that can be flattened out and stored away. It has an opening at the top for your pet as well as side meshing to provide good ventilation. You load the dog through the top which makes it easier for certain breeds that can be a little nervous. There is a comfortable cloth neck rest for when the dog is looking out. It has many pockets for storing your possessions, leads and dog treats or toys. The lining of the tote carrier can be removed and washed when needed. The long handles mean that you can easily carry like a traditional tote bag. The inside is comfortable and spacious which makes it suitable for small dogs like chihuahuas. This is not a suitable carrier for all occasions and is much better for quick trips around town. If you want more security, there is not the leash/harness attachment that often comes with pet carriers. The straps aren’t adjustable so you can’t wear it across your shoulder. This could be a problem if you want to be hands-free. There’s a lot to be said for the Sherpa Tote Around Town Pet Carrier, and it fits the bill for many dog owners. It’s both stylish and blends in with what you expect to see around town or on a city street. If you want to keep your dog hidden when you go in-store, it works quite well. This is a tote bag style carrier that many fashion-conscious owners will want to have in their collection. For short trips, it’s the ideal carrier and works perfectly in busy areas like towns and cities. Where there’s a lot of foot traffic on the street, or when you want to go in-store without people knowing you have a dog, it’s a pretty useful product. While some flight operators will allow it to be used as an in-cabin pet carrier, some don’t so if traveling on airlines a lot you need to check. 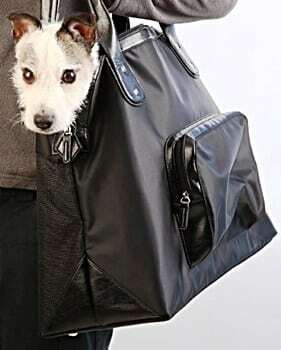 The great news is that, even if you are leaving your dog at home, you can use the carrier as a normal tote bag and go and do your shopping or pop to the office. This has been a popular choice for many customers over the last few years. Not everyone wants a carrier that looks purely functional or is too bulky. Many want something that will blend in with their look, and this is a perfect example of such a carrier. Most people have said that it looks bigger than expected when they get it out of the box. This can be a problem for some dogs, but for many, it just means they have more room to move around. The soft lining is also a plus, and something customers (and dogs) appreciate. The extra space is useful if you do have to close the top zip for any reason and it gives your dog the chance to move around if needed. Additional features such as the wide pockets and Velcro fastenings have also impressed buyers. Customers haven’t just bought the carrier to get around town. One buyer was undertaking a road trip and didn’t want to leave their dog in the car to overheat. The tote bag canine carrier was perfect for popping out to the gas station or in store when needed. It seems that small dogs can quickly become acclimatized to using a product like the Sherpa Tote Pet Carrier. If you are having a problem with other carriers like the pooch pouch, then this one might well solve your problem. One of the things people like about this product is that it doesn’t look like a conventional dog carrier at all. Some customers thought that the bag was not suitable for taking your dog around all day. The straps can become a little uncomfortable after a while. If you’re looking for a stable carrier that you can put down wherever you are, this is probably not the best choice. It’s more of a pickup-and-go carrier to get you stylishly from A to B. Slightly weightier dogs can be more difficult in this kind of bag despite it being roomy. It’s certainly suitable for those up to about 15 lbs. but you should be wary of choosing it for heavier dogs unless they are fairly placid. Overall, the reviews for the Sherpa Tote Pet Carrier have been good. Most of the customers who bought it use the carrier to travel quickly around town. Some use to hide the fact they have a dog with them when they go into a shop or even restaurant. Whether this works or not often depends on your dog. For those looking for something that doesn’t necessarily look like a real dog carrier, this is a pretty good choice. It does have limitations such as how long your dog will want to stay there. There’s also no additional leash catch to keep your pooch in place. If you would like a much sturdier, yet comfortable way to take your cat to the vet, read our Petmate Two Door Top Load Pet Kennel review. It also provides a good way to take your cat or kitten to the vet. Top load carriers and totes are much easier for felines because they feel more comfortable being lowered down. If you’re looking for a good performer, this may not be top of your list. For getting around town and for easy loading and unloading, however, it does fit the bill.